Join over 200,000 residents, students, businesses, organizations and community groups as we come together for the 15th annual city-wide cleanup of public spaces. 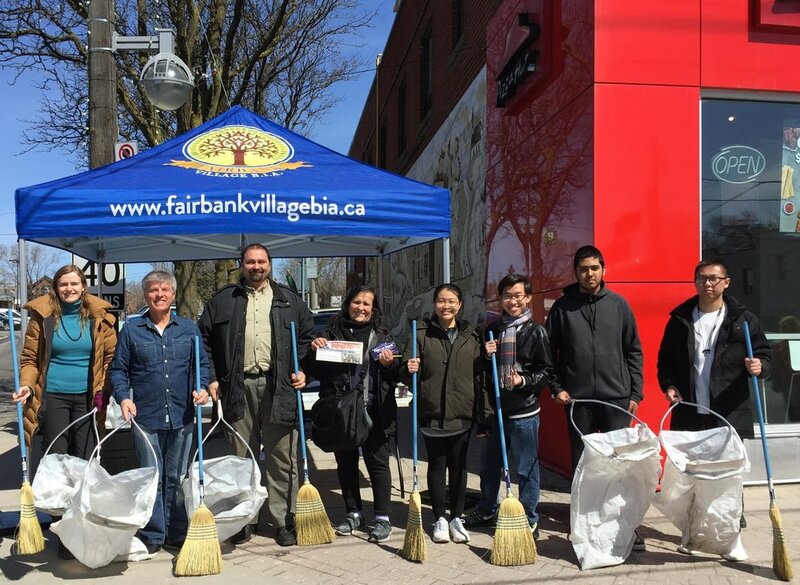 Take pride in your community and come give us a hand with the Fairbank Village Community Clean Up. Meet us at the blue tent on the corner of Shortt Street and Eglinton Avenue West beside Pizza Hut. May to September, Fairbank Village is offering monthly outdoor movie screenings on Shortt St. one block West of Dufferin St., on the North of Eglinton Ave.W. They are all are family-friendly and best of all, they’re completely FREE. It’s recommended to BYO blanket or chair, or grab a spot on one of the benches along the sides. Those with blankets will be able to sit closer to the screen. Popcorn is FREE! Enjoy a movie night with the Fairbank community! Outdoors on Shortt Street at Eglinton Avenue West, in between TD and Pizza Hut. *This is a permitted event. Amplified speakers may be in use until 11pm. A section of Shortt St. will be closed from 6-11pm for the event. Join us for some free family fun at our annual street festival with FREE Rides and Entertainment. Great shopping and food from our fabuolous vendors. Outdoors along Eglinton Avenue West, West of Dufferin Street to Ronald Avenue. The road will be closed for the event from the early hours of Saturday until Monday morning. Stop by Fairbank Village and get your FREE Pumpkin and have some family fun! Enjoy a Hotdog and free activities courtesy of local Fairbank Village businesses! Free facepainting and activities will be available for the kids. Costumes are welcome, but not required! This year we'll continue our new Trick or Treat component for the first 100 KIDS! Come decorate a goodie bag and visit participating businesses to collect free candy! Stop back at the main event location to be entered into a draw for a Halloween prize! Fairbank Village BIA in partnership with Local Police Officers are sponsoring a new initiative called COFFEE WITH A COP. This project is a result of a survey with the business community members who rated improving the perception of security in the area and establish links with local authorities as one of the top priorities for the area. The event will be held on Monday, January 21, 2019 from 4:30 to 6:00 pm at 1893 Eglinton Ave. West (Mulu Bakery). We encourage residents and business members at Fairbank Village to stop by for a few minutes anytime during this event. It will be an informal environment where people can share a coffee with the Officers and raise questions, concerns, suggestions or just say hello to improve safety in the Fairbank Village. If you require more information, please contact us info@fairbankvillagebia.ca or 416-646-0661. All are welcome! This is a drop-in event. The coffee and the pastries will be free for participants. We would like to welcome the community to celebrate the two new community artworks on Thursday, November 8 from 3:30-5:30pm.